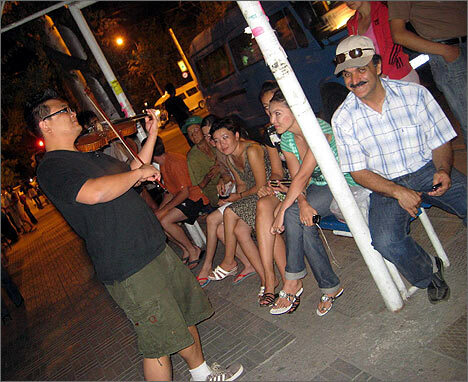 Bishkek residents are surprised to hear unusual music on the streets of the otherwise very quiet city. A violinist, who grew up in Tokyo and Taiwan, studied and got married in the US, is a living representative of a cultural polyglot. Public concerts by Sean Kao are extremely popular in New York and New Jersey, Bangkok and Taipei, Tokyo and Beijing, Amsterdam and Moscow. He had a chance to play his music at the famous Carnegie Hall in the US. Today Sean is playing music on the streets of the Kyrgyz capital Bishkek. 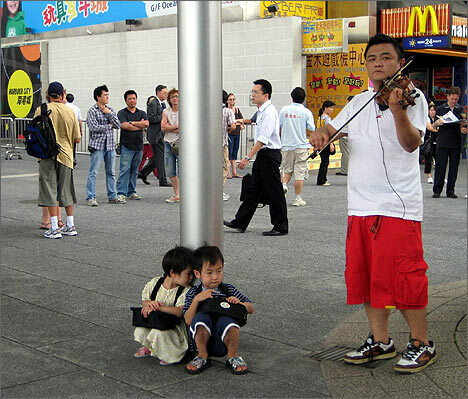 Some people want to give him money, but he explains that he plays for the audience to enjoy the music and it is free. I met Sean on the street and immediately decided to talk to him. Very soon we became good friends. Ferghana.ru: Sean, how did you end up being in Bishkek? Sean Kao: My wife is Kyrgyz and we have two wonderful kids together. All of them are here, in Bishkek. My admiration of the Central Asian culture and desire to learn more about it brought me to Kyrgyzstan. This is my third visit - in 2005 I came for a year to teach violin courses to children in Tokmok (north Kyrgyzstan). Ferghana.ru: What kind of music do you play and what do you write yourself? Sean Kao: I play music of the peoples’ of the world, from Indian traditional motives to Texas songs, Jewish music and Arabic dances. I play Katusha and Kalinka-Malinka and other songs, which people are so much fond of in the post-Soviet space. As for my own pieces, I like to create different interpretations to the already existing works. 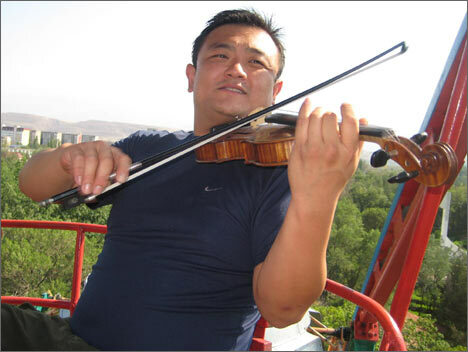 Ferghana.ru: When and how did you start loving music? 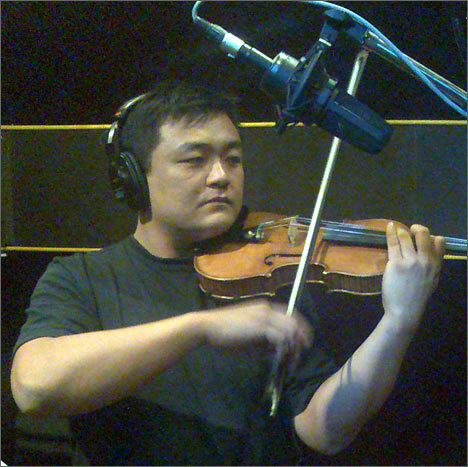 Sean Kao: When I was six I saw a person playing violin and was tearfully begging my mother to send me to a music school. However, after several months I started hating violin and cursed the day I asked my mom to send me to a music school (laughing). Many years later I understood that violin is my world where I could realize my most ambitious plans. Ferghana.ru: How do you know that the audience likes your music? Sean Kao: People are approaching and thanking me after each performance, some of them offer help. They approach me with tears and say that my music awoke old good memories; some thank me for making their day and allowing relaxing and forgetting about problems for a moment. I had couples who asked me to play on their weddings. Some people ask to play under the windows of their loved ones. I am very happy when I bring joy to people. Ferghana.ru: Did you have any problems with the local authorities? Sean Kao: No, I did not because I don’t take money for my performances. However, sometimes policemen ask me whether I am performing in support for a political party or whether I am calling for a meeting. But then they see that I am playing solely for the audience without seeking to spread propaganda or agitate for an action. There was one moment when I participated by pure accident in the meeting called “Youth and Music in Fight Against HIV/AIDS and Drug Addiction” organized by the Youth Power movement. I could not stay aside, of course, and decided to participate. Ferghana.ru: Why don’t you charge money for your performances? Sean Kao: The joy which I bring to people with my music is the biggest treasure I can get from them. Seeing that people like my music and understanding that I am making them happy is priceless. Ferghana.ru: How do make your living then? Maybe you are a millionaire? Sean Kao: No, I am not. But I am quite well off, so I can afford playing for my joy and not for money. Right now I am recording an audio CD because my listeners want to have compositions performed by me. I pay for the recording, I do not have sponsors, maybe because I did not look for them. Also, I am giving classes to young musicians for free. Ferghana.ru: Judging by your extensive international experience, I guess that Bishkek has been not the only stage for your free performances? Sean Kao: You are right, I intend to travel around Central Asia, to visit Uzbekistan and Afghanistan and perform in city parks and squares in those countries. Ferghana.ru: Do you like being in extreme situations? In Uzbekistan you should not have big problems, but in Afghanistan you might encounter terrorist. How is that? Sean Kao: The more you dissuading me from going there, the more I want to go to Afghanistan. I think in that county my music and music in general can do much more than military and politicians can do. I am talking about the feeling of peace and real joy of life, which music is capable of bringing. I think that music is a more effective tool in spreading peace than any politics. Ferghana.ru: Do you seriously believe that your music can make people forget about their daily problems, injustices and politics? Sean Kao: I believe that listening to my music they can feel power of the beauty at least for a moment. And this power might transform their consciousness, motivate for something new, create a new vision and understanding that not everything is so bad and that every person can influence his or her own future, the future of the people and change it for the better. Ferghana.ru: Many foreigners in Central Asia are said to “promote democratic principles”. Aren’t you afraid that the same stereotype will be applied to you? Sean Kao: I am American, but I have Asian roots and Asian upbringing. The latter could never be crossed out by any American values. I am not in support of ‘americanization’ of Central Asia or destruction of national identity. To be honest, I do not want my children to be like many of today’s Americans who think that their values and believes are superior and should be disseminated throughout the world. And in general, I am distanced from politics, I am a musician and do my job without interfering into anyone’s business. Ferghana.ru: How come you’ve become interested in Uzbekistan? Sean Kao: I’ve learnt about great Uzbek culture through the Internet and through some compositions of my colleagues in America who are coming from the former Soviet Union. I hope that after visiting this country I will enrich my repertoire with Uzbek melodies. I am very eager to visit Samarqand, Bukhara and Khiva, which are the cradle of Central Asian history. I also have very good friends in Uzbekistan whom I have not seen for a long while. Ferghana.ru: If you compare audiences in different countries, which one is the most grateful? Sean Kao: You would not believe, but the most ungrateful people live in the countries preoccupied with their own problems. They are so rich and so much into themselves that they don’t want to waste their time and listen for a moment. The biggest thing they can do is to look at you for a second and pass by. And in the countries where not everyone can afford going to a concert or buy a CD with classical music are so attentive and thankful for such small street concerts that you want to play for them over and over again non-stop. 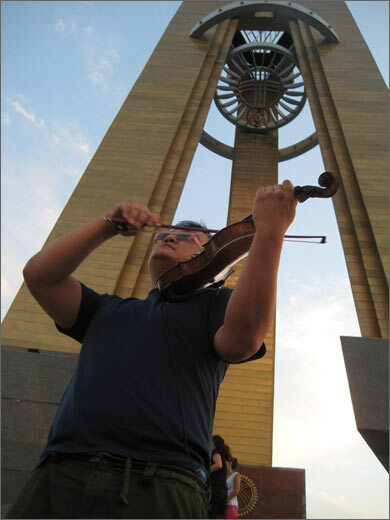 In Bishkek I already have a circle of grateful listeners who try to attend each concert and follow me from park to park. They postpone plans and follow their dreams with my music.